BlogPet CareIs Your Puppy a Destructive Chewer? Being a pet parent to a new puppy can be exciting, but it can also get expensive if your pup is constantly chewing up your stuff. Unfortunately, investing in professional training and pricey toys may not always be in your budget. That’s why every new pet owner needs to have these money-savvy tips for keeping those adorable puppy teeth off of your furniture. 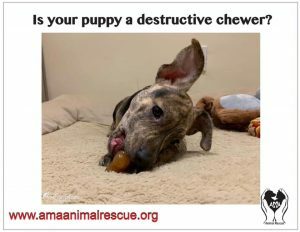 Puppies are going to chew — there’s really nothing you can do to completely stop this natural puppy behavior. So, why not start by showing them what they can and cannot chew on around your home. Before you even bring your new puppy home, you should stop by Walmart and pick up an arsenal of chew toys and products to safely satisfy your puppy’s urge to chew, without having them chew on your expensive furniture and personal belongings. You can find a wide array of puppy chew toys online or in-store at Walmart, and you can even search for cheaper items to save you money. Before you hit the checkout lanes, be sure to search online for Walmart coupon codes, which can help you save even more on your pet supplies. However, if your pup still seems more interested in chewing rugs and furniture than any of his or her toys, you may also want to look for chew deterrent sprays to use on those items. If you prefer, you could even pick up inexpensive ingredients, such as apple cider vinegar, to mix up some homemade non-toxic chew deterrent spray on your own. There are so many reasons why puppies chew. Boredom and destructive behaviors are often connected when it comes to puppies and dogs. Just like other babies, puppies can be filled with endless amounts of energy. And if you don’t put that energy to good use, you may find your puppy acting it out all over your expensive furniture. Luckily, the solutions to your dog’s boredom do not have to impact your budget at all. All you need to do is schedule some time to take your puppy for walks throughout the day and maybe spend some time learning new tricks. If you have not leash-trained your puppy, use these free tips to teach your furry friend how to have fun on those all-important walks. Your puppy may need to warm up to a collar and leash at first, so be patient with your training. It also doesn’t hurt to have some tasty treats on-hand to help reinforce positive behaviors. You can look for coupons and deals for pet treats online, or you can use some your inexpensive pantry staples to whip up a few easy-to-make homemade dog treats of your own. Dogs and puppies are super cute, but they also tend to be very opportunistic when you are away. If you need to leave your puppy alone during the day, be sure to research online to figure out how long is too long for puppies. When you need to travel or be away for extended periods of time, hiring a pet sitter may be a more sound solution to prevent destructive chewing behavior. You can save on pet-sitting fees by asking a family member or friend to snuggle with your pup while you are gone. Most people are more than happy to hang out with an adorable puppy without payment but you can offer a home-cooked meal to show your appreciation. Crate-training is also a good way to keep your puppy out of trouble when you are out, so be sure to check out online training guides for tips on how to get your dog acclimated to staying in a crate. If you need to purchase a crate, you can save a ton of money by searching secondhand sites for used crates instead of buying one brand new. You can put a stop to destructive chewing without putting a dent in your budget. All you need are some online promo codes and a lot of patience to curb your puppy’s chewing.